Message 5 – Mother’s Thirteen Commandments/Love Directives, plus…. Mother: Hello, Sarah! I like your hiking clothes today. A mighty smart-looking rain-parka you’re wearing. But you don’t need to worry about it raining on us in our Sacred Grove this afternoon. I’ve made arrangements about that. I know it looks ominous, but you should be able to get back to your box on wheels, what you call your car, before the skies open up. Sarah: Thanks, Mother. I was rather worried about these clouds. Mother: Oh, don’t be worried. You’ll be fine. Okay, so my turn for the joke. I can’t remember where I heard this one. How did the panda who misplaced his dinner feel? Sarah: Yes, I get it. I get it. Hmmm … Mother, no offense or anything, but I think I need to get you a good joke book. I mean a really good one. Mother: You don’t like my jokes? I think they’re good. I like them. Anyhow, enough of jokes for now. So the last time we met I promised you I would come up with my own set of Commandments. Not the same ones that many two-leggeds read and pray on from that black book. These are Mother’s Commandments. There are thirteen of them. Along with some precepts or whatever you want to call the other list. I like the word precepts myself. I, Earth Mother, gave the planet a song. Know that you are part of this song as one in the vast web of life, no greater, no less. All that you do affects the song, for better or for worse. Your thoughts, both positive and negative, affect the song as much as your actions. Everything has consciousness, the stones, plants, even mountains, rivers and oceans—all join in the song. Know that your thoughts and actions are registered in the song and affect the stones, plants, mountains and all, for better or for worse. Developing silence of the mind and from this place—deep gratitude is one of the most positive things you can do for Mother and all others in the song, especially those very sensitive and intelligent ones such as the whales and the dolphins. Fear that comes from your head is an illusion. Fear that comes from your instincts is not. Learning to discern between the two will help in stilling your mind and being in the moment. The song is most harmonious within an energy dance of love, compassion, tenderness, patience and cooperation. It is good to learn this dance with all beings with whom you interact, whether two-legged, four-legged, winged or finned ones, standing ones (trees), or stone people. Come to understand your shadow self and make bringing it to consciousness to heal it part of the dance and celebration. It is all just energy—money, time, your job, your play, your love. Choose to make it as positive as possible and lose the illusion of fear with this energy dynamic. Love is the foremost energy. Mother loves you. You all evolved from love. Evolution is an act of love. Know that perfection is an illusion. You are all the most beloved and delightfully flawed beings as two-leggeds and that is how it is meant to be—and it makes you all the more lovable. Know and honor your Mother as you honor your Creator. And if you want to put an icon of me on an altar, that’s fun. But any other graven images are not needed. Have fun! Life is a celebration! Life is an adventure! The more you celebrate life, the more you help your Mother to heal all over the planet, and encourage the whales and dolphins and all others in the song to sing more harmoniously with you! Touch Mother everyday. Touch her skin, her earth. Let her healing energy come into you to calm you and heal you. Do not gouge Mother’s skin or break into her bones. Do not create compounds that will last longer than the very short-term out in nature. Honor the forests and replant trees. Honor the wetlands and restore them. Clean up your rooms. Big and small. Live in community. All are part of the community. Everyone’s needs should be taken care of by the community. Share. Speak with an open heart. Be lean of judgment and speech. Be open to the mystery that lies in people and the world around you. Now, I’ll explain a little bit to help out here. I know that some of your smartest scientists have started to write about what they called Quantum Physics. I call it Sacred Energy, but never mind that. So everything has an energy field to it and there is a vibrational hum to these fields, but not too many of you can pick them up. But these fields exist and some of your two-legged equipment can pick them up. 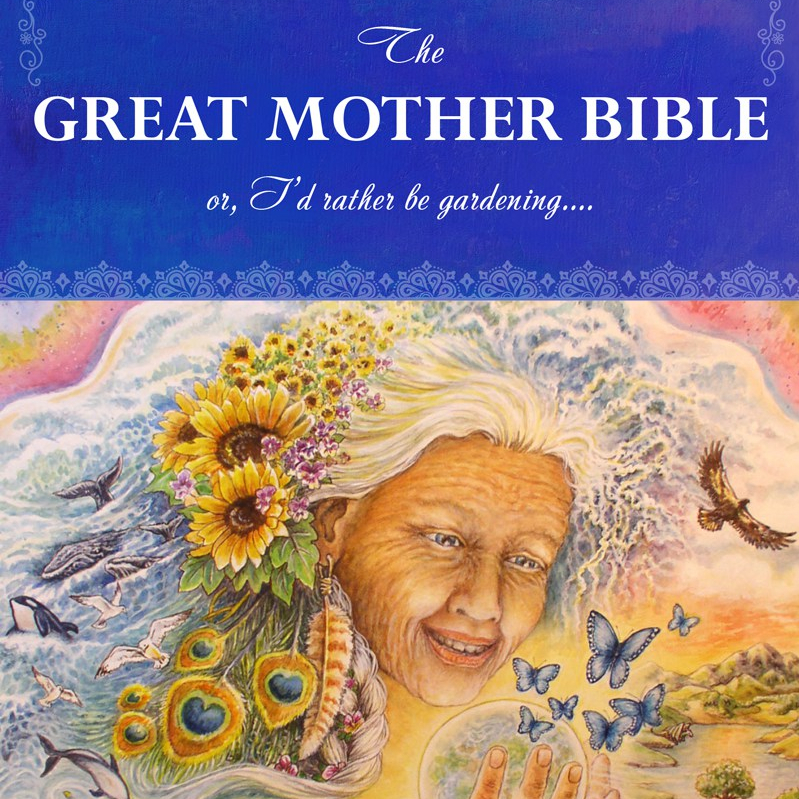 I, as Earth Mother, also have a vibrational tone or hum. This is not the sound of an earthquake or lightning storm but a consistent hum. It’s not any human sound. Far from it. Your two-legged ears can’t hear it. It would be nice to think I could join a chorus with it, but now that I’m thinking about it, my tone is part of the universal chorus and the smaller group of humming planets from the solar system along with all the other planets, stars, asteroids, black holes, etc. in the universe. Not all of our sounds are pleasant to everyone but that’s okay. There is also a collective vibration or set of sound waves that all of you two-leggeds give off. It used to be a lovely sound for thousands and thousands of years. But more recently, your sound has gotten rather … well … hard to take. There is so much anger and hatred and violence in it. It makes me so sad. Plus, it is really hurting the dolphins and whales, not to mention the other species children here—this sound that all of you two-leggeds are making together. Now don’t get me wrong. Some of you, my beloved two-leggeds, are putting out a beautiful song as individuals. When some of you gather to meditate and still your minds, this is a beautiful sound for me. Or when there is a lovely drumming circle in the woods and you are all feeling so joyful with the beating of the drums together on the ground. Oh, that’s a lovely, lovely vibration that makes me so happy. But not too many of you do that. Nor do you sing very often. You are all so serious. Then you go and watch movies of such violence, or play war videogames. I don’t understand this at all. You all need to lighten up so much! Your life is meant to be one of celebration, singing, drumming, dancing. Growing food together. Singing to the plants to help them grow. Drumming to the moon. Sharing all of these beautiful foods together so everyone has food. Oh, I could go on and on. Definitely you need to have shelter and clothes and food, but to be so unhappy about making that all happen in your lives. How sad this is, for you and for me. For all the species. There is just so, so much fear in your lives. This pains me and makes your song kind of hard to take. I love you all so much. I really do. This is perplexing to me that your society has taken the song to this place. So, it’s getting on and the clouds are looking more threatening and I can’t stave off the rain forever. So let’s continue this conversation next time. Thank you, Sarah … Thank you. I love you. I love all of you buckets and buckets, oceans and oceans!